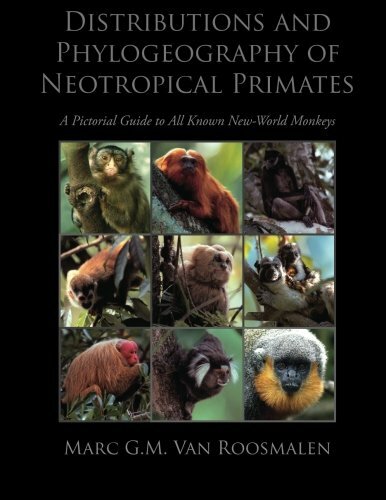 This is the first complete pictorial field guide to all the known Neotropical Primates/Monkeys of the New World. All taxa are depicted in full color by illustrators Stephen Nash and Piero Gozzaglio according to their phylogeography. Moreover, splash pages containing many, often unique photographs taken by the author of both monkeys in the wild or kept free-ranging in several rehabs/halfway houses run by him over more than 16 years in the rain forest at about 30 km from the city of Manaus-AM, Brazil. Included are also a number of recently identified but not yet published taxa new to science, among which several of the largest-sized Amazonian monkeys (i.e., Ateles, Lagothrix, Chiropotes, Cacajao). Named one of the HEROES FOR THE PLANET by Time Magazine in 2000, Dutch and naturalized Brazilian primatologist, Dr. MARC VAN ROOSMALEN, has certainly proved one requires super hero qualities to navigate not only the Amazon jungle, but also the "monkey business" politics of governments and world environmental agencies. Landing in a Brazilian jail in 2007 among convicted murderers being charged for alleged biopiracy, this world renowned explorer was sentenced for 14 years to be spent in a public jail. Concerned that scientific inquiry was being criminalized, outraged scientists worldwide came to his appeal and after an extensive legal battle, in 2009 he was acquitted of all charges by the Supreme Court. After spending 30 years exploring the Amazon, Van Roosmalen has become the world's leading expert on the Amazon's ecology with emphasis on monkeys, plant-animal relations in seed dispersal, and coevolution. He has discovered 5 new monkey species and a new genus CALLIBELLA, and identified another 20 new primates. All these new mammals, incl. a cf. PONTOPORIA dolphin and a dwarf manatee, are described in his Magnum Opus “Barefoot through the Amazon”. He has also discovered evidence of prehistoric Amerindian horticulturists farming in the Amazon, and surmises that the soil enhancement methods employed by them already for over 5000 years could offer an alternative to the destructive slash-and-burn techniques used today. Clearly seeing the devastation of the "Lungs" and the "Carbon Sink" of our planet, Van Roosmalen has been committed to the conservation of the rain forest. He has been an outspoken critic of corporate and governmental corruption that has led to the illegal logging and deforestation in the Amazon. Addressing his exploration and discoveries, his activism, and controversial incarceration, many articles have appeared in the press, including the New York Times, Time, Newsweek, Guardian, Smithsonian Magazine and Wired. National Geographic has produced the documentary film about him titled SPECIES HUNTER. The Institute of International Education through its Scholar Rescue Fund has procured a position for Dr. van Roosmalen as "Distinguished Scholar in Residence," at Bard College and SUNY for the academic year 2010-2011. Here, he was teaching courses in rain-forest ecology and human rights as well as developing relationships with American institutions to stabilize his dream - a biological and anthropological research station in the heart of the Amazon. Van Roosmalen, Dr Marc G. M.
Van Roosmalen, Dr Marc G.M.